Willem de Kooning (; Dutch: ; April 24, 1904 – March 19, 1997) was a Dutch American abstract expressionist artist who was born in Rotterdam, the Netherlands. In the post-World War II era, de Kooning painted in a style that came to be referred to as Abstract expressionism or Action painting, and was part of a group of artists that came to be known as the New York School. Other painters in this group included Jackson Pollock, Elaine de Kooning, Lee Krasner, Franz Kline, Arshile Gorky, Mark Rothko, Hans Hofmann, Adolph Gottlieb, Anne Ryan, Robert Motherwell, Philip Guston, Clyfford Still, and Richard Pousette-Dart. 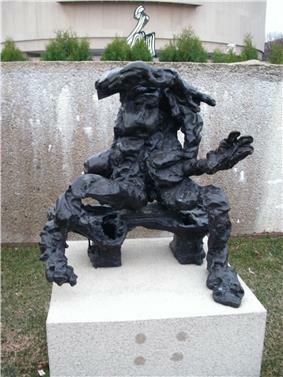 In 1926 de Kooning travelled to the United States as a stowaway on the Shelley, a British freighter bound for Argentina, and on August 15 landed at Newport News, Virginia. He stayed at the Dutch Seamen's Home in Hoboken and found work as a house-painter. In 1927 he moved to Manhattan, where he had a studio on West Forty-fourth Street. He supported himself with jobs in carpentry, house-painting and commercial art. De Kooning joined the Artists Union in 1934, and in 1935 was employed in the Federal Art Project of the Works Progress Administration, for which he designed a number of murals including some for the Williamsburg Federal Housing Project in Brooklyn. None of them were executed, but a sketch for one was included in New Horizons in American Art at the Museum of Modern Art, his first group show. From 1936, when De Kooning had to leave the Federal Art Project because he did not have American citizenship, he began to work full-time as an artist, earning income from commissions and by giving lessons. De Kooning's paintings of the 1930s and early 1940s are abstract still-lifes characterised by geometric or biomorphic shapes and strong colours. They show the influence of his friends Davis, Gorky and Graham, but also of Arp, Joan Miró, Mondrian and Picasso. In the same years de Kooning also painted a series of solitary male figures, either standing or seated, against undefined backgrounds; many of these are unfinished. De Kooning’s well-known Woman series, begun in 1950 the time after meeting his future wife and culminating in Woman VI, owes much to Picasso, not least in the aggressive, penetrative breaking apart of the figure, and the spaces around it. Picasso’s late works show signs that he, in turn, saw images of works by Pollock and de Kooning. 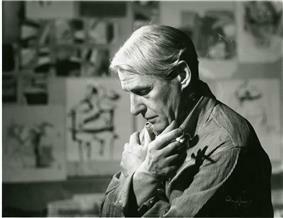 :17 De Kooning led the 1950s’ art world to a new level known as the American Abstract Expressionism. 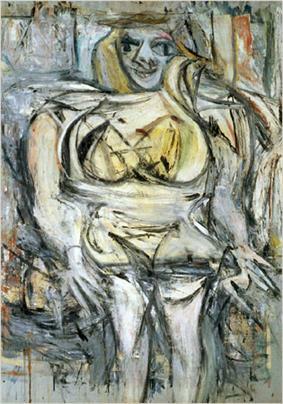 “From 1940 to the present, Woman has manifested herself in de Kooning’s paintings and drawings as at once the focus of desire, frustration, inner conflict, pleasure, … and as posing problems of conception and handling as demanding as those of an engineer.” The female figure is an important symbol for de Kooning’s art career and his own life. This painting is considered as a significant work of art for the museum through its historical context about the post World War II history and American feminist movement. 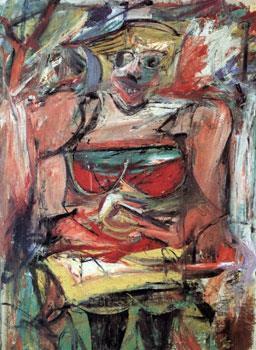 Additionally, the medium of this painting makes it different form others of de Kooning’s time. Willem de Kooning: Painting on the theme of the Women, Sidney Janis Gallery, New York, March 16- April 11. "Women" Drawing by Willem de Kooning, Hames Goodman Gallery, Buffalo, January 10-25. ^ a b c d e f g h i j k l Harry F. Gaugh (1983). 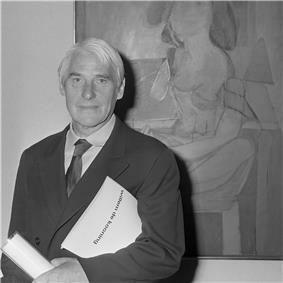 Willem de Kooning. New York: Abbeville Press. ISBN 9780896593329.